Last Monday, the heads of 10 major U.S. corporations teamed up with four leading environmental organizations to form the United States Climate Action Partnernship, calling on Congress and the president to support mandatory caps on greenhouse gas emissions "at the earliest practicable date." The group included the chief executives of Exxon's competitor, BP America, as well as GE, Duke Energy, DuPont, PG&E, Alcoa and others [full list on the USCAP website]. VYCON, , a leading company in the development and manufacture of advanced, green tech, high cycling energy storage flywheel systems, today announced a strategic alliance with MGE UPS SYSTEMS, Inc. to provide an environmentally friendly, clean energy alternative to traditional Uninterruptible Power Supply systems. Initially, the offering will include MGE's Comet and Galaxy PW models which will be integrated with VYCON's VDC flywheel system. The VYCON VDC is a flywheel based energy storage system that provides a stable, reliable, low-maintenance, extended-life DC voltage source for critical power applications. The VDC, which can be seamlessly paralleled for higher power requirements, can completely eliminate the need for maintenance-laden batteries in traditional UPS applications by providing sufficient ride-through for short duration power outages or until a standby engine-generator can come on line. "This alliance represents an important opportunity for both companies," said Tony Aoun, President and CEO of VYCON. "MGE is a market leader in the UPS industry and working with them will allow us to bring highly reliable green technology to a greater number of companies around the world. As MGE customers are requesting higher reliability and environmentally beneficial systems, MGE will now be able to provide customers with a solution for both concerns through our VDC system." Herve Tardy, VP Marketing of MGE UPS SYSTEMS North America added: "We were very impressed by the VYCON VDC flywheel system and are looking forward to working together to offer our customers a reliable, maintenance free system without the environmental and cost implications of batteries." Many leaders of American industry are coming around to the view that global warming is occurring and that Congress will address the problem. In contrast, a few companies are considering major investments in old technologies for burning coal that would both endanger the climate and jeopardize the financial position of their investors and shareholders. As members of the U.S. Senate, we have both worked on legislation designed to combat global warming and to reduce greenhouse gases, such as carbon dioxide emitted from fossil fuels. Although our approaches have differed slightly, we both agree that global warming is real, that we need to act rapidly to pass legislation, and that we are committed to working together to achieve that result as soon as possible. Global warming is an enormous threat to mankind, and the United States can, and must, be a leader in reducing greenhouse gas emissions. One of the largest sources of greenhouse gas emissions comes from burning coal to produce electricity. While ultimately our goal should be to move toward efficient use of renewable energy sources, we recognize that currently coal is America's most abundant domestic energy source and will be a critical resource for many years to come. Fortunately, several technologies are available and under development to facilitate our ability to continue using coal in ways that are both financially sustainable and address its climate impact. Power plants that rely on technologies such as coal gasification, for example, will ultimately allow carbon dioxide emissions to be captured and stored at a much lower cost than coal plants using old-fashioned technology. The bills that we and our colleagues have worked on anticipate that coal-fired power plants will need to substantially reduce greenhouse gas emissions. Perhaps most important, companies building new coal-fired power plants today should acknowledge that over the 50-year lifespan of such plants, reduction of global warming emissions will become mandatory - probably sooner rather than later. Building a new coal plant without taking into account global warming is neither good for the environment nor smart financially. We have been dismayed to watch some companies unveil plans to spend billions of dollars to build new coal-fired power plants using old technology that cannot capture global warming emissions. Apparently part of the motivation for building these plants is that the companies mistakenly believe that these new plants will garner "grandfathered" emission allowances under some future law. Such plans assume that future legislation will freely award the majority of such allowances to the biggest emitters, and, therefore, increasing pollution through new plants will reap large sums of emission allowances. This flawed thinking will be a tragedy for the climate because of the additional carbon dioxide emissions this old technology creates. It also is a dangerous business strategy for the utilities' investors and shareholders, who are putting money into technology that will be obsolete the very day it goes into service. As the new Senate committee chairs engaged in the fight against global warming, we think it is important for investors to understand that there is little chance that the majority of such allowances will be allocated without cost and exclusively to large emitters of greenhouse gases. In fact, companies that appear to be inflating their emissions right before legislation is passed are likely to find themselves in a position of having to make even larger emissions reductions than companies that do not attempt this strategy. We do not envision that any successful legislative proposal will contain a provision that would allow those building traditional coal-fired power plants to economically benefit from coming in "under the wire" and being considered part of the emissions baseline - in fact, the opposite is likely to occur. Any company planning to spend billions of dollars on new coal-fired power plants, and any investor in such a company, should think carefully about how to spend their funds so as to be part of the solution to climate change, not a part of the problem. Jeff Bingaman chairs the Senate Committee on Energy and Natural Resources, and Barbara Boxer chairs the Senate Committee on Environment and Public Works. Their e-mail addresses are Senator_ Bingaman@bingaman.senate.gov and feedback@boxer.senate.gov. This letter was much needed! My boss, Rachel Shimshak, and allies at the National Resource Defense Council have been pushing the idea of a bipartisan letter from the key sponsors of the climate change bills in the Senate and House - i.e. Boxer, Bingaman, McCain and Lieberman - and as many others as possible putting utilities on notice that any new coal-fired power plants built in an attempt to get in 'under the wire' of upcoming climate change regulations would NOT be grandfathered into the bills (as was the case in the Clean Air Act). Apparently, either the right people in the Senate Democratic Leadership heard the idea, or they had a similar one themselves and chose to issue this letter. It would have probably had more impact if it could have been a bipartisan letter, with more signatories, but this is still a very clear notice from the chairs of both key Senate committees that will be relevent to the upcoming debates on climate change regulation. Thank you Senators Boxer and Bingaman. Now if we can only ensure that Boxer's bill, or a similar one, is the one that finally moves. Bingaman's bill is pathetically lenient and won't accomplish enough to really save us from the brunt of climate change consequences. The McCain-Lieberman bill is a bit better, but is still more focused on economic and political rationale than scientific ones. When it comes to climate change, there's no point in a bill that isn't based on the science. Why try to rein in our emissions if we're not going to do it quickly enough or seriously enough to stabalize atmospheric CO2 emissions at a low enough level and avoid anything more than a 2 degree C temperature increase (and the associated consequences)?! From the RH Top 10 Predictions for 2007: Maturing industry means easier times for people making the switch. Solar will get easier in 2007, which will be a step up from where it’s been. Aside from the pain of spending $20,000 upfront to buy the system, a solar enthusiast like Berkeley, California-based photographer Joseph Homes, for example, jumped hurdle after hurdle to get the equipment. Among other headaches, he had to schedule six installation phases between the roofer and the solar installer, navigate three different panel-rating systems to figure out which panels to buy, field inspections from the county, and buy costly homeowners’ liability insurance. Solar’s complexity, costs, and risks have deterred all but the most determined. But 2007 may finally be the year that solar gets easy to install. With the end of a worldwide shortage of solar-grade silicon in sight, competition is expected to heat up, and the solar industry is preparing with a buying spree. System integrators—which match customers up with the right panels and other equipment—and installers could be attractive fodder for manufacturers looking for ways to place more panels on rooftops. Attention-grabbing acquisitions signaled the start of this consolidation last quarter, when SunPower bought PowerLight, the largest commercial solar integrator in North America, and when German firm Conergy bought Swiss solar integrator Voegelin. Neal Dikeman, a partner at Jane Capital Partners, expects plenty more deals like this in 2007. Companies ripe for the picking? Several players say it’s the industry’s “worst-kept secret” that Solar Depot is on the market. Innovative integrators like SunEdison and Energy Innovations, groSolar, and Akeena Solar would also make tasty targets. All the buying will mean consumers may soon be able to deal with a single company, instead of handling the modules, inverters, financing, and installation separately. That would make for a simpler experience, and maybe even convince mainstream buyers to take the plunge. SolarCity, a provider of comprehensive solar solutions, has completed phase one of a commercial solar power system for Space Exploration Technologies Corporation (SpaceX). The move marks the company's entry into the Southern California commercial solar market. SolarCity installed an initial 29 kW roof-mounted solar array at SpaceX's El Segundo facility in only four-and-a-half days, and expects it will quadruple the system's size in subsequent stages. The SpaceX solar system uses unique patented hardware, which mounts quickly and requires no roof penetration. Dennis Jones, facility manager of SpaceX, said that the SolarCity solar system is a practical, forward-thinking measure to help offset the company's power load. "Solar power is a clean, responsible and cost-efficient way for SpaceX to conduct operations," said Mr. Jones. "SolarCity's quality, low- impact installation quickly provided a return on our energy consumption, and reserved us the ability to scale-up afterwards," he said. SolarCity is one of only a handful of solar providers worldwide actively installing non-penetrating roof mounts. "SolarCity's design engineers prepared a full seismic and wind load analysis to ensure that the system met city measures of El Segundo," said SolarCity's chief executive, Lyndon Rive. "California is a leader in residential and commercial solar, and companies of all sizes are increasingly realizing that solar power makes a responsible, economical business decision," Mr. Rive said. "SolarCity will continue expanding its SoCal operations in the coming months to help service the growing pool of residential and commercial customers throughout the state and beyond." In many countries, higher oil prices have hurt pocketbooks and led to worries about economic slowdowns. But here in Japan, Kiminobu Kimura, an architect, says he has not felt the pinch. In fact, his monthly energy bill is lower than a year ago. A reason is his new home fuel cell, a machine as large and quiet as a filing cabinet that sits in front of his house and turns hydrogen into electricity and cold water into hot — at a fraction of regular utility costs. But even with the futuristic device, which is available for now only in Japan, Mr. Kimura has not let up on the other shortcuts that leave him unscathed by last year’s oil squeeze. Energy-efficient appliances abound in the many corners of his cramped home. There is the refrigerator that beeps when left open and the dishwasher that is compact enough to sit on the kitchen counter. In some homes, room heaters have a sensor that directs heat only toward occupants; there are “energy navigators” that track a home’s energy use. And then Mr. Kimura, 48, says there are the little things that his family of four does to squeeze fuel bills, like reusing warm bath water to wash laundry and bicycling to buy groceries. Japan is the most energy-efficient developed country on earth, according to most specialists, who say it is much better prepared than the United States to prosper in an era of higher global energy prices. And if there is any lesson that Japan can offer to Americans, they say, it is that there is no one fix-all solution to living with oil above $50 a barrel. Rather, as Mr. Kimura shows, it is a combination of many things, from the most advanced technologies to the simplest frugality in everyday life — and an obsession with saving energy that keeps his family huddled in a single heated room during winter. Japan tops most global comparisons of energy efficiency in wealthy nations. Its population and economy are each about 40 percent as large as that of the United States, yet in 2004 it consumed less than a quarter as much energy as America did, according to the International Energy Agency, which is based in Paris. Japan’s obsession with conservation stems from an acute sense of insecurity in a resource-poor nation that imports most its energy from the volatile Middle East, a fact driven home here by the 1970s shocks. The guiding hand of government has also played a role, forcing households and companies to conserve by raising the cost of gasoline and electricity far above global levels. Taxes and price controls make a gallon of gasoline in Japan currently cost about $5.20, twice America’s more market-based prices. The government in turn has used these tax revenues to help Japan seize the lead in renewable energies like solar power, and more recently home fuel cells. One way has been a subsidy of about $51,000 for each home fuel cell. This allowed Mr. Kimura to buy his cell last year for about $9,000, far below production cost. His cell, which generates one kilowatt per hour, provides just under half of his household’s electricity, and has cut his electricity bill by the same amount, he said. The device works by converting natural gas into hydrogen, which the fuel cell then uses to generate electricity. Heat released by the process is used to warm water. 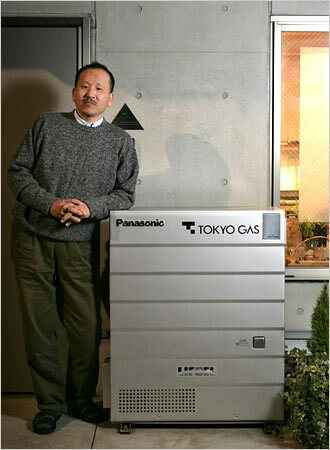 The first two fuel cells were installed in the prime minister’s residence in April 2005. Since then, some 1,300 have been sold, according to the trade ministry. The ministry forecasts that as sales pick up, production cost will fall to about $5,000 by decade’s end. Experts say that Japan is far more willing to embrace new technologies than the United States, where opposition to hydrogen storage tanks in Tarrytown, N.Y., forced General Motors to scrap an experimental filling station for fuel-cell cars last year. Higher energy prices have also created strong domestic demand in Japan for more conventional and new energy-saving products of all sorts. That has spurred the invention and development of things like low-energy washing machines and televisions and high-mileage cars and hybrid vehicles, experts say. Japanese factories also learned how to cut energy use and become among the most efficient in the world. Companies like Mitsubishi Heavy Industries are now reaping the benefits in booming overseas sales of their highly efficient electric turbines, steel blast furnaces and other industrial machinery, particularly in the United States. The environment ministry forecasts that exports will help turn energy conservation into a $7.9 billion industry in Japan by 2020, about 10 times its size in 2000. “Japan has taught itself how to survive with energy prices that are twice as high as everywhere else,” said Kouichi Iwama, an economics professor at Wako University who advises the Japanese Parliament on energy policy. But with a few exceptions like cars, many of Japan’s efficient consumer products have yet to make their way overseas, according to corporate executives. Partly, that is because while more energy-efficient, they are also more expensive. But another reason is that many appliances here are designed for Japan’s conservation-conscious lifestyle, which includes things like smaller homes and a lack of central heating. Mr. Kimura says he, his wife, and two teenage children all take turns bathing in the same water, a common practice here. Afterward, the still-warm water is sucked through a rubber tube into the nearby washing machine to clean clothes. Wet laundry is hung outside to dry or under a heat lamp in the bathroom. “In Japan, it’s natural to think about saving energy,” Mr. Kimura explains. “We learned not to waste from our parents, who had learned it from the hardship of the war and after,” he said. The different approach is also apparent in the layout of Mr. Kimura’s home, which at 1,188 square feet is about the average size of a house in Japan but only about half as big as the average American one. The rooms are also small, making them easier to heat or cool. The largest is the living room, which is about the size of an American bedroom. The government has tried to foster a culture of conservation with regular campaigns like this winter’s Warm Biz, a call to businesspeople to don sweaters and long johns under their gray suits so that office thermostats could be set lower. It has also encouraged development of energy-saving appliances with its Top Runner program, which has set goals for reducing energy use. Products that meet the goals are awarded a green sticker, while those that fail get an orange sticker. Japan’s trade and industry ministry says consumers heed the stickers, pushing manufacturers to raise the energy efficiency. The average air-conditioner now uses two-thirds less electricity than in 1997, and the average freezer 23 percent less, the ministry said. The savings add up. The average household here used 4,177 kilowatt- hours of electricity in 2001, the most recent figure, according to the Jyukankyo Research Institute in Tokyo. In the same year, the average American household consumed more than twice that, or 10,655 kilowatt hours, according to the Energy Department. When Columbia County resident Tanya Patton wants to get a library book for herself or one of the four children she home-schools, she has to visit the nearby Dayton Library during the 21 hours the library is open during the week. Even with limited hours, keeping the library going has required endless rounds of bake sales, book sales, raffles and other fundraisers from Patton and other supporters. But the library soon will get significantly more funding, thanks to a boost in the county's property tax revenue generated by the new Hopkins Ridge wind farm [pictured above]. Patton led a campaign to form a new county library district that will share resources with the city library, which may allow the library to extend its operating hours or put its catalog online for the first time. Across large swaths of Eastern Washington, wind farms are generating tax revenues as well as electricity, pumping additional money into county coffers. As more wind farms are built, their construction and the taxes they generate may have a profound impact on the economic landscape of rural counties. Three new wind farms -- Hopkins Ridge in Columbia County and Wild Horse and Big Horn in Klickitat County -- were completed in Eastern Washington within the past year, bringing the state's total to six. Those three facilities more than double the state's wind-energy production, generating enough power to serve three-quarters of the households in Seattle. They will also generate about $3.6 million a year in property taxes during their first 10 years in operation, according to Renewable Northwest Project, a Portland-based coalition of environmental and consumer groups and energy companies. And the wind-energy trend is gaining speed, thanks in part to Initiative 937, which will require large utilities to increase the renewable power they generate. Another half-dozen wind farms are under construction, ready to break ground or in the permitting process. Others may follow, since significantly more wind power will likely be required to meet the goals of I-937. The Democratic Congress also appears poised to extend the production tax credit that makes wind power competitive with energy from other sources. But the industry faces significant challenges, including a lack of transmission capacity to carry power from Eastern Washington or even Montana and Idaho, the areas with the highest potential to generate power, to Western Washington, the area of highest power demand. The industry, and individual wind-power developers, also have plenty of critics. Some residents of Eastern Washington consider wind farms visual blight. David Bowen, chair of the Kittitas County Commission, said he's gone to public meetings about proposed wind farms and heard residents say that constructing the projects would mean reducing the quality of life in Kittitas to serve the Puget Sound area's energy needs. Audubon Washington supports wind-energy development, but the organization also wants the state to study wind-farm siting to reduce impacts on wildlife. Audubon Washington and other groups say proposed wind-farm projects need to be evaluated to ensure they won't kill large numbers of birds and bats. For better or worse, construction of wind farms seems likely to continue for several reasons. While the Northwest's massive hydroelectric dams have provided cheap and abundant electricity for decades, much of that power is spoken for, and new electricity sources must be found to accommodate growth. Concerns over global warming and pollution make renewable power sources such as wind farms more appealing than such options as coal-fired power plants. Some utilities, such as Bellevue-based Puget Sound Energy, the owner of the new Hopkins Ridge and Wild Horse projects, are embracing wind energy. And many customers and lawmakers support renewable power for reasons such as environmental and energy-security concerns. Voter support for renewable energy was evident with the November passage of I-937 [see previous post], which requires large electric utilities to get 15 percent of power from renewable sources -- other than existing hydroelectric dams -- by the year 2020. Wind energy will likely make up a significant chunk of that. Although some of the 15 percent will come from solar, biomass or biogas and other sources, wind energy will be a substantial part because wind power is cheaper to produce than solar. Today, only about 1.3 percent of the state's electricity comes from wind. Some of the wind energy produced in Washington, such as electricity from the Big Horn project in Klickitat County, is sold to other states such as California. The three new wind projects completed within the last year represent significant chunks of capital. According to Renewable Northwest Project, they represent $840 million in total project investment and capital costs, about 743 short-term construction jobs and 39 to 50 permanent jobs. In addition to the roughly $3.6 million the projects will generate in annual property taxes over the first 10 years, the turbine owners are paying landowners between $1.2 million and $1.85 million in royalties. A landowner can get between $2,000 and $5,000 per turbine per year. Some of the economic effects are being felt even before the property tax revenue is being collected. While Hopkins Ridge was being built, workers bought goods and services in the surrounding community, said Jennie Dickinson, executive director of the Dayton Chamber of Commerce. "The hotels were full of workers, and the state of Washington has a lodging tax that can be used for tourism promotion," Dickinson said.